Extreame Savings Item! 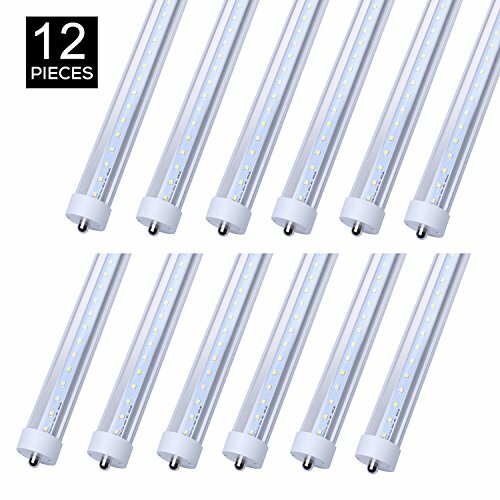 Save 49% on the Jomitop T8 LED lamp Tube Light 8ft 45W Replacement 100 Watt Fluorescent Tube Lamp 5000K Daylight White Double-Ended Power Clear Cover Pack of 12 by Jomitop at Blog Free Here. MPN: FA824-TS45W-50K12. Hurry! Limited time offer. Offer valid only while supplies last. FAT DELIVERY - Ship from LA warehouse via FedEx,3-7 days delivered,No importing duty. EASY INSTALLATION - International standard shape for FA8 tube light 8 ft, Easily fitted instead of traditional fluorescent tube lamps, bypass the starter and ballast before installation. PROVEN TRACK RECORD - Preferred by most contractors, electricians, and wholesalers. Installed in schools, hospitals, parking lots, office buildings, and hotels. ECO-FRIENDLY - No lead or mercury, no UV or IR radiation. CRI over 80,dramatically improve the appearance of products by allowing colors to appear clear, vivid and distinguishable. HASSLE FREE WARRANTY - Free 3-year product unlimited warranty is offered to our customers, email us for any query and we will be in touch within 24 hours. Replacement or refund will be provided for your preference. If you have any questions about this product by Jomitop, contact us by completing and submitting the form below. If you are looking for a specif part number, please include it with your message.